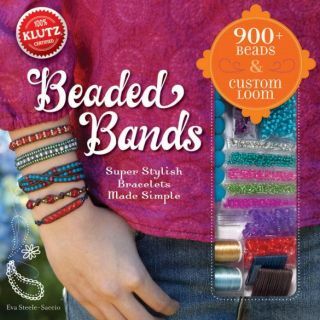 Make super stylish bracelets or beaded bands. Contens: loom, 8 yards of cord, 16 yards of beading thread, 3 beading needles, 7 closure beads, 900+ beads in different styles and sizes and a 60-page full-color instruction book to inspire and to show 7 stylish bracelets to make. You will need (and not provided in the kit) are a sharp pair of scissors and a small towel or piece of felt to put the beads on. For ages 10 - adults.